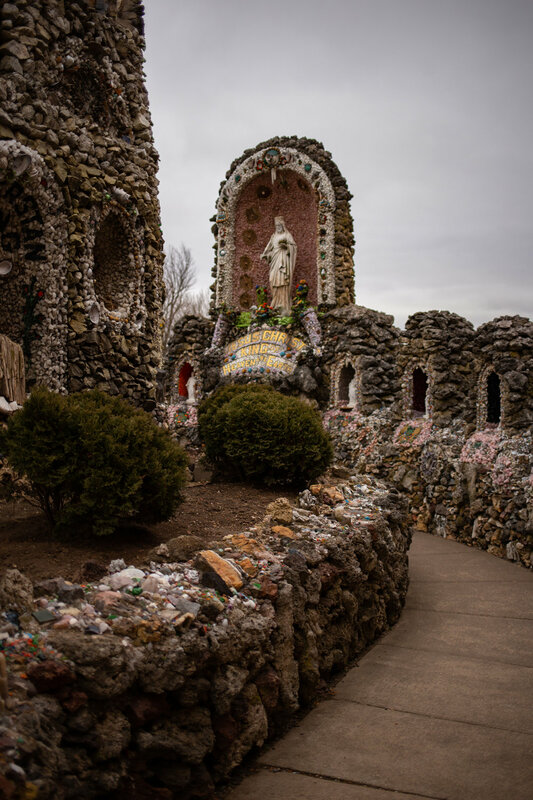 The Dickeyville Grotto and shrines were created from 1925-1930 by Father Matthias Wernerus, a pastor of the Holy Ghost Church and Parish. Located in Dickeyville, Wisconsin, about 15 minutes northwest of Dubuque, Iowa and the Mississippi River that divides the two states, the shrines were built from materials collected from all over the world, including stones, shells, colored glass, fossils, jewelry, pottery, dishes, precious metals and sea creatures. The main shrine is home to the Grotto of the Blessed Virgin and there is a shrine dedicated to patriotism, a shrine of the Holy Eucharist, a Sacred Heart shrine, a Christ the King shrine and a Fatima shrine. The centerpiece of the main grotto is an Italian White Carrara Marble statue of the blessed virgin, sculpted in Europe. The interior is protected by transparent panels to deter theft and protect the artwork, but it also makes it nearly impossible to get a good photo (another argument for seeing these roadside gems in person). The site is visited by more than 40,000 people every year, although we were the only visitors on a very cold Friday in December. There’s no admission fee but donations are appreciated. There is a gift shop (of course) that sells Bibles, rosaries, religious statues, medals, prayer books and CDs, but its hours vary seasonally and it wasn’t open when we visited. 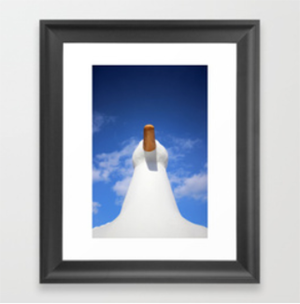 In addition to the obvious religious themes, the patriotic shrine also includes depictions of Christopher Columbus, George Washington, Abraham Lincoln and the Liberty Bell. I’m not in any way religious, but I do love passion projects and these shrines are incredible works of art—even more so when you consider that they were essentially the work of a single man. Wernerus did have help, including benefactors and of course, his faith in God; volunteers pitched in to finish the last shrine after Wernerus died in 1931, and Stations of the Cross were added in 1963, but the artwork you see today is almost exactly as Wernerus intended. 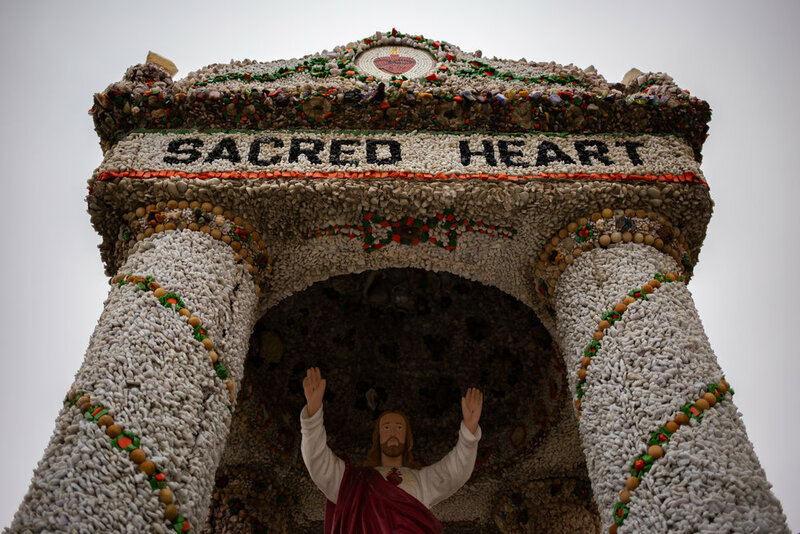 The Dickeyville Grotto is the kind of religious expression that you’d expect to find in a desert setting (like Salvation Mountain or Desert Christ Park), where fanaticism and creativity seem to flourish—but the need to fill the hours of a life with a meaningful task is seemingly universal. According to Roadside America, “a grotto-building contagion struck the Midwest and south in the early 20th century,” a phenomenon they call “dementia concretia,” otherwise known as “the helter-skelter compulsion to cover whatever outdoor space you have with home-made art” (see also: the mosaic house of Brooklyn or Philadelphia’s Magic Gardens). Gift shop hours vary seasonally, but you can see the Grotto even when the shop is closed.